TOKYO (AP) — The U.N. agency that has provided food aid to North Korea for nearly two decades says it has enough donations to stay open for the rest of this year but is uncertain whether it will be able to operate there beyond next March. The World Food Program has been struggling to meet its funding needs. Donors have been less generous with the North because of concerns over political issues there and the perception that aid is more urgently needed elsewhere — particularly in parts of Africa and the Middle East. Silke Buhr, the WFP’s regional spokeswoman, said the crisis has been averted for now. “We are no longer in danger of closing our operations in DPRK at the end of this year,” she said in an email late last week from her office in Bangkok. “We have received enough donations or promises of donations to enable us to reach the full caseload of 1.1 million women and children per month until the end of March 2015.” North Korea’s official name is the Democratic People’s Republic of Korea. She added, however, that the operation is only 40 percent funded and said “more funds are urgently needed to maintain the operation” after next March. The WFP, which has operated in North Korea since 1995, announced in April that because of the lack of funds, it was unable to provide 500,000 rural schoolchildren with assistance. Last year, it drew up a $200 million, two-year program targeting 2.4 million children and pregnant or nursing mothers. But that was scaled back to 1.63 million, and has since been scaled back even further. To meet its targets, WFP needs about $8 million a month. Sixty percent of WFP donations come from governments, but since 2008, amid heightening tensions over the North’s nuclear and missile programs, aid from the U.S., South Korea and Japan evaporated. But Seoul announced in August a contribution of $7 million to the WFP to provide food for North Korean children and pregnant women, along with $6.3 million to the World Health Organization to provide the North with medicine, improve medical facilities and help train medical personnel. Opponents of engagement argue that aid is siphoned off to the North’s military and nuclear weapons programs, ends up lining the pockets of elites and eases pressure on the government to deal wholeheartedly with its own domestic economic problems. While the North has come a long way since its catastrophic famine and economic breakdowns in the mid-1990s, the WFP says it continues to suffer food shortages made worse by frequent natural disasters, limited economic growth and the lack of seeds, fertilizers and fuel. According to a WFP report earlier this year, North Koreans had been getting larger rations of rice, potatoes and corn over the past two years. In March, the amount provided under the North’s Public Distribution System was 410 grams per day, per person. North Korea hopes to increase that to 573 grams. 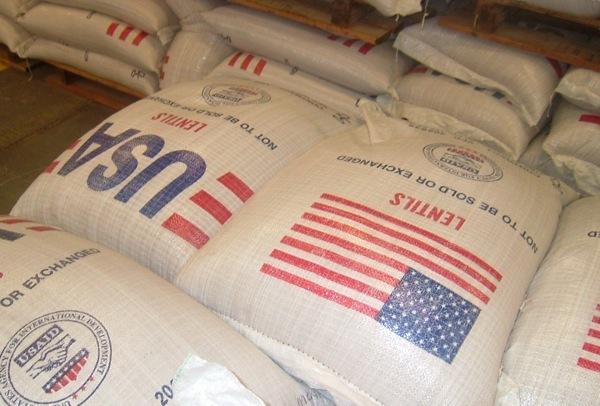 But Buhr said that according to recent information provided by the North Korean government, only about 250 grams of cereals were provided as rations in August and September. She said that rose to 400 grams in October, probably due to part of the harvest having been collected and a wheat donation from Russia. Eric Talmadge is the AP’s bureau chief in Pyongyang. Follow him on Twitter at twitter.com/EricTalmadge.